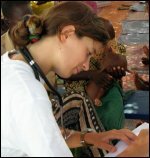 Dr. Sylvaine Blanty, a general practitioner, has been working at the Doctors Without Borders/Médecins Sans Frontières (MSF) therapeutic feeding center for severely malnourished children in Aguié, Niger, for a month. 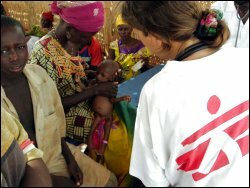 Before coming to Niger, she had already worked with MSF in the Democratic Republic of Congo (DRC). She writes about her experience over the last month. They may be very dehydrated and sometimes they are severely anemic. They often suffer from multiple severe infections. In a few days, I can see major change. When I approach a child and he looks at me, I know he's doing better. This mission is different from my earlier ones in the DRC. 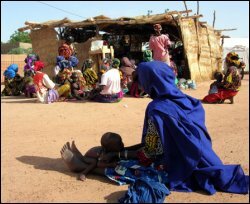 Here, there are many more children and, in particular, many of them are in very serious condition. In other malnutrition treatment programs, children remain hospitalized until they have recovered. Here, once they are doing a little better, they go home and just go to a health center near their village once a week until the treatment is completed. That's much better for both the child and mother. The doctor provides the initial treatment, but then it is the mother's responsibility to feed the child the supplemental food. We are there to follow developments and intervene if the child does not gain enough weight, but it is the mother, at home, who cares for the child and helps him recover. Nearly nine out of ten children leave the program having met their weight gain goal. I primarily treat children who come to intensive care–often very late. Some are semi-conscious and others have breathing problems because of respiratory infections. They may be very dehydrated and sometimes they are severely anemic. They often suffer from multiple severe infections. In a few days, I can see major change. When I approach a child and he looks at me, I know he's doing better. When I come close and he has the strength to cry, I'm pleased. If he agrees to eat, that's a key first step and if he asks for food, that's wonderful! After that, I don't see the children any more. They're ready to go home and continue treatment, so I won't see them smile and play again. And then there are the ones you couldn't save, the ones you treated, unsuccessfully, for several days. You fought for them, you were hopeful, you thought you saw a positive sign, and you wanted to believe. And then they relapse. You try to revive them and you do everything you can. All the other mothers in the intensive care unit are watching. And then it's over. You tell the mother. She waits while you withdraw the drip and remove all the medical equipment. She puts the child on her back and leaves, carrying him just as she has every day since he was born. Some say thank you. Others cry. Tears run down their cheeks. They don't move or say a word. Their face is frozen. Their calm devastates me. In a sense, it's easier because I don't have to face their anger or hear their cries. But I'm used to seeing emotions expressed. The silence is brutal.